A project such as the one we are proposing functions from a philosophical understanding that a living community has both the ability and the responsibility to deal with issues in the community. The theatrical process unlocks knowledge that already resides, but may be dormant in the community itself. Forum Theatre is an opportunity for creative, community-based dialogue. The theatre is created and performed by community members who are living and/or are knowledgeable about the issues under investigation. During a six day THEATRE FOR LIVING workshop, up to 20 workshop participants engage in very specific games and exercises that help them investigate issues at a deep level. The workshop ‘tills the soil’ of the issue. A cast, working with a director, stage manager and production team of designers, then has three weeks to create and rehearse a short Forum play, usually no more than 25 minutes in length. Once in performance, the play is performed once, all the way through, so the audience can see the situation and the problems presented. The story builds to a crisis and stops there, offering no solutions. The play is then run again, with audience members able to "freeze" the action at any point where they see a character engaged in a struggle. An audience member yells "stop! ", comes into the playing area, replaces the character s/he sees struggling with the problem, and tries out his/her idea. We call this an ‘intervention’. The process is fun, profound, entertaining and full of surprises and learning. Headlines’ THEATRE FOR LIVING workshops have evolved from Augusto Boal’s “Theatre of the Oppressed”. Since 1989 Headlines’ work has slowly moved away from the binary language and model of “oppressor/oppressed” and now approaches community-based cultural work from a systems-based perspective that a community is a complexly integrated, living organism. Because the actual content of a project like this must come from the workshop participants who are living the issues, it is impossible to be absolutely specific about what exactly will be addressed in the play, but we can be certain that the story will somehow deal with the complexity of human relationships (both internal and external) that contribute to an overarching paralysis regarding changing the core behaviours that have led to climate change. While the play must tell a human story, the human actions and relationships will also translate into larger, structural processes. It is not enough, doing issue-based work of this nature, for the play to be about something important. It must also be good art. It is, I believe, the artistic quality of Headlines’ work that ‘hooks’ audiences. It is the deep engagement in the experience of the art that opens the doors to community transformation. “(Headlines’ Meth) leads to an immediacy of understanding that no amount of well-intentioned discussion can achieve. Many of the (audience) interventions demonstrated that when people attempt to make meaningful connections, it can go a long way toward filling the hole that addiction—whether to drugs, alcohol, or work—keeps trying to fill. ...director Diamond skillfully brings home the point that even the smallest gesture can open the door to positive change." We at Headlines know from years of experience that this project can and will function as a true voice of people who are themselves struggling with the issues. Because the play creators carry this expertise the play will certainly help audiences seeking personal and structural solutions. How do we make it ‘sticky’? In today’s world, in which we seem to be coated with Teflon regarding behavioural change, how do we get the insights in the Forum Theatre events to ‘stick’? It may be possible to turn the Forum Theatre event into a kind of game. We are thinking of having an environmental consultant at every performance; someone who has the knowledge and ability to calculate the theoretical carbon reductions that result from the ideas audience members put forward at each performance. At the end of each intervention, the consultant will calculate and announce these reductions. At the end of each performance, we will announce a total and compare the total to previous audiences. The consultant will be able to point out how ideas (and the subtleties of different ideas) contributed to high or low carbon reduction scores. This good-natured competition should help the ‘stickiness’ factor of the event. Yes, but does it have a concrete result? In 2005 Here and Now contributed to work of the “Group of 10: Integrated Community Response to South Asian Youth Violence Committee”, which we believe, if implemented by the Federal Government, will have a measurable impact in reducing violence in the community. Meth (2006/07) worked in collaboration and support with addictions counselors throughout BC. Responses from them are above. start a “buzz” about the show that will translate into both community workshop participant recruitment and audiences. In February, 2008, (at the Russian Hall) we will gather a group of up to twenty participants together who are cognizant of the issues. Prior to the start of the research workshop, we will interview all the participants and from those interviews, decide on a cast. The workshop itself should not be an audition. It is important that each person coming into the process knows what their involvement and time commitment will be. Using the workshop as the material from which the performance grows, the cast, production team and I, will then have 3 weeks to create an artistic production for presentation to the public. This is the same creation model as was used in Headlines’ very successful Forum Theatre projects such as Don't Say a Word, (Don’t Say a Word was honoured in 2003 with the Red Cross “Power of Humanity” Award.) Practicing Democracy, (Practicing Democracy was honoured at the 2003 Jessie Richardson Awards with Jessies for “Outstanding Production” and “Significant Artistic Achievement”.) Here and Now, Meth and many other projects. Designers, technicians, and a stage manager will be involved at this stage to ensure that the play has a high quality of production. By creating the best art we can from the material and artists emerging from the community, the production will in itself provide a positive focus of community energy. The play will tell a story in which characters are struggling with the complex issues emerging from climate change. The Forum events will ask the audience to engage in concrete solution investigation that leads to personal and structural behavioral change. We will perform from February 21 – March 2 at the Scotia Bank Dance Centre in downtown Vancouver. Community organizations involved in the issues under discussion will work with Headlines' Staff to promote the theatre events. 2º of adaptation will be surrounded by day-time workshops led by representatives of grassroots organizations dealing with specific aspects of the issue. These workshops will focus on concrete steps people can take on both personal and structural levels to create behavioral change that will decrease stress on the environment and also increase functionality as the world around us changes. a daytime session in collaboration with a corporation, in their corporate offices, on how business can function as “green” as possible. This would also be open to the public. Other location/sector specific workshops, also open to the public. $12.00 to see the play. $5.00 to attend one workshop. $20.00 to see the play and get a pass to attend all workshops. It is essential that costs are affordable for lower income people, and are about equal to the cost of a movie. It is for this reason that we are undertaking fundraising a large percentage of the budget. Ticket prices will be finalized closer to the end of our fundraising process. We have confirmed the participation of SHAW Community TV on an interactive tele/web cast of the production. On average, we do these tele/web casts once a year. This will broaden the reach of the performances greatly. It will also generate a non-commercial DVD that can be used by communities after the live project has ended. An estimated 15,000 viewed the Meth telecast. Another 578 computers logged onto the viewing site for the web cast. Some of these computers (hooked up to large screens) had up to 50 people attending, as there were “web cast parties” organized in many places around the world. We will never know an exact number of web viewers but even averaging 5 per computer, this gives us 4,660 web viewers. Burnaby, Calgary, Coquitlam, Fort Nelson, Kitimat, Montreal, Ottawa, Prince George, Saskatoon, Terrace, Toronto, Vancouver, Victoria and Winnipeg, all in Canada; Bellingham, Everett, Milwaukee, Norfolk, New York City, Sacramento, Washington DC, and unnamed cities in the States of Arizona and Honolulu, all in the US; Armidale, Brisbane, Canberra, Hobart, Perth and Sydney, all in Australia; as well as Osaka, Japan; Scheemda, Netherlands; and Tel Aviv, Israel. As well as the intervention in the theatre, we took interventions from Australia, Honolulu, Israel and Winnipeg, Manitoba. 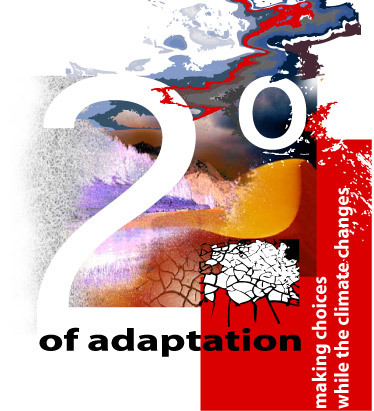 The 2º of adaptation project should do what it tries to discuss. Do professional theatre companies think about the carbon impact of producing theatre? This topic has never, to my knowledge, been raised in the discussions of Professional Cultural Associations, the Canada Council or other arts bodies. Is it possible for the theatre to be completely carbon neutral? Probably not. Is reducing the theatre's impact on the environment possible? Absolutely. How do: fundraising, outreach, publicity, the community workshop process, the creation and rehearsal processes, design, construction, technical aspects, performance and also final reporting impact the environment? How do we reduce the impact? What is successful? What is not? What can we DO in THIS production? What could be done in future productions? As we move through 2º of adaptation, all personnel will do what we can in all of these areas, both to be aware and also to act. We are seeking out tools to help us keep track of the carbon impact of producing theatre. When we are finished, Headlines will bring all the information together and contribute a document to whoever wants it that could open this conversation up at the level of professional cultural associations, unions and funders. It has to start somewhere. An e-mail circulates about two mansions in the US. One of them is a gas guzzler, with a carbon footprint 20 times the national average. The other is a “model of green-ness”. The former is the home of Al Gore; the latter the “Texas White House” of George W. Bush. The story makes me sad, outraged, uncomfortable – and then I think – why do I care? I care about this seeming “injustice” or “hypocrisy” as an excuse to not change my own behaviour. Each and every one of us has to get our own house in order, and step out of the pattern of convenient excuses. While it is true that we need leadership and policy change from Government and the business sector, we cannot rely solely on Government to make the changes that are necessary in the coming years and decades regarding the results of climate change. A community is a living organism. In the same way that our bodies are comprised of cells that make up the living organism of our bodies, a community is comprised of people that make up the living organism of the community. The way communities used to express themselves and process information was through song, dance, drama etc. Today, these activities have become commodified; we buy movies, books, dance, theatre, TV – we pay strangers to tell us stories about strangers. It would be a deepening of the global tragedy that is evolving if the ramifications of climate change become yet another “entertainment” that we watch unfold on TV. The use of primal language (in this case the theatre) to tell collective stories (in this case about the community’s struggle with climate change) and then the resulting community dialogue through Forum Theatre cannot help but be a very healthy and enlightening way for the living community to collectively process the steps necessary to both cope with and reduce the human impacts regarding this issue. A final report on both the process, the finances and the product will be created for funders, and also for theatre practitioners and other interested parties around the world who are interested in the practical applications of THEATRE FOR LIVING.